You only want highest quality media for cell cultivation? At PAN-Biotech, perfect raw materials combined with state-of-the-art technologies guarantee a first-class quality of our media. 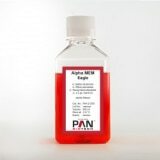 Other sizes and custom formulations: Almost all media available from PAN-Biotech can be filled in special containers as per customer requirement. Besides standard bottles in 100, 500, and 1000 ml, medium can be filled in cans (up to 10 L), bags (up to 500 L), or other containers with fittings according to customer specifications for special applications such as continous feed process or production purposes. Special media and custom products: 4 to 6 weeks after receipt of order. Liquid media with L-Glutamine can be used also after the expiry date, but have to be supplemented with new L-Glutamine in this case. Shelf life starts on date of production! Benefit from the experience and know-how of PAN-Biotech. Our state-of-the-art production facilities, with a production line specifically installed for these requirements, allow us to produce the formulations especially developed for your needs in constant high quality also for longer periods of time, and to make batch sizes adapted to your need. Our team of scientists will be pleased to advise you regarding your proprietary formulation. Phosphate buffered saline, without calcium and magnesium; without phenol red; powder.